Service Level Agreements Fulfilled. Customer Unhappy. Have you ever come across the situation where the IT Service Level Reports always show “green”, but in reality the delivered services did not match the customer expectation at all? If yes, please read this blog and you might find out that you either have the wrong SLA’s defined or focus too much on them without considering the most important factor: Service culture. Before thinking about what went wrong, let’s go back one step and recap the process which is mainly responsible for making sure that the delivered service levels meet the expectations of the business and the customers: Service Level Management. Within the Service Level Management process, Service Level Agreements (SLA’s) are negotiated and agreed together with the customer in a first step, based on his expectations to the IT Services. This should result in clearly measurable KPI targets. For example there might be the expectation from the customer that certain critical IT services are highly available, one possible resulting KPI target is an minimum average availability level of 99.9% of this IT Service during business hours. Once these targets are agreed within the SLA document and signed off, the actual service performance is continuously monitored against the SLA targets, resulting in a periodic service level report, showing how ‘good’ the IT Service provider is doing his job. In above example it might either turn out that the IT service was sufficiently available, therefore meeting the targets (equal or above 99.9% ->’green’) or below the expectation agreed in the SLA (->’orange’ or ‘red’). If this is the case, corrective actions need to be taken (e.g. as a part of a Service Improvement Plan) to bring the IT Service to the level it should be – or alternatively the KPI targets needs to be redefined in agreement with the customer. The Service Level Management process along the Deming Cycle: A self-fulfilling control-loop, automatically leading to satisfied customers? 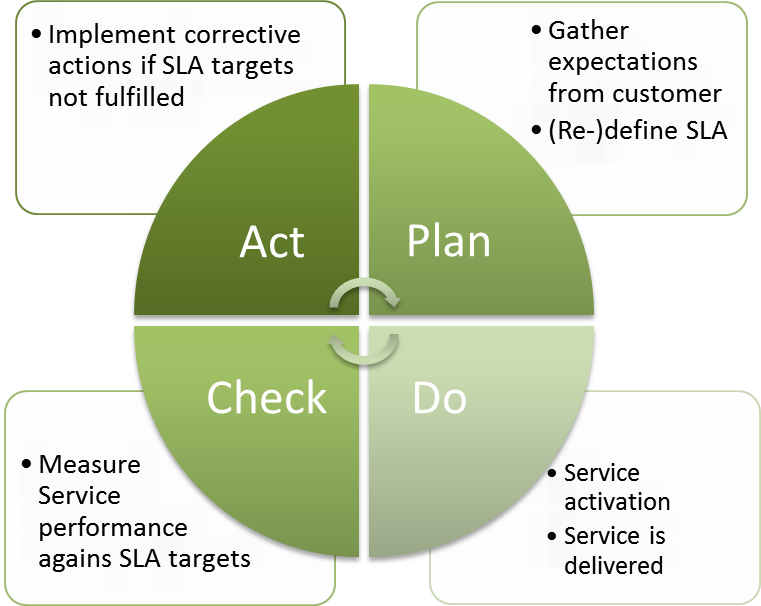 If you are familiar with the principles of the Deming Cycle, you see how the in itself closed control loop is nicely adapted: Plan (setting the SLA), Do (delivering the IT Service), Check (measuring what has been delivered against targets) and Act (taking corrective actions if there is a gap). If you ever worked as an IT Service Manager you know the importance of Service Level Management and what the benefits are: A consistent interface is provided to the business for all service-related issues and discussions around service quality are brought from a subjective to an objective level (based on facts). Last but not least it is a good platform to meet regularly with your customer and strengthen the relationship. SLA targets should support the expectations of the customer to the service and it is therefore important to choose a balanced set of KPI’s, which finally measure the value contribution to the strategy. Please keep in mind that the customer is usually living in a changing environment and therefore his IT Service needs can change over time. This is one additional reason why SLA’s need to be revised from time to time. Excitment factors: Make the difference! There are a number of ‘soft’ factors, which positively influence customer satisfaction (or negatively if absent) and which are difficult to be defined as part of an SLA and cannot be monitored by mechanistic or procedural means. For example, incidents always might be solved in a quickly manner and IT services highly available (-> meeting the targets in the SLA), however if the Service Desk agents have an unprofessional and unfriendly way in communicating with their customer, this ends up in a low overall customer satisfaction. Although service level targets are missed sometimes, the customer might be highly satisfied, because he sees that appropriate actions are taken to improve things and the provider has an ‘Always at your service’ – mentality. This especially refers to the so-called ‘excitement factors’ (Kano customer satisfaction model). These soft factors can be best summarized as “Service Culture”, which indicates that, for everyone in the provider organization, customer satisfaction is the top priority and that IT Service provider activities demonstrably contribute to the business objectives of the customer. 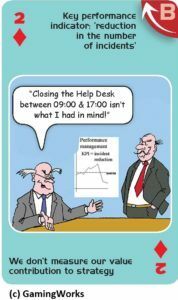 Incident Management: Not meeting the expected reaction- or resolution times? As an IT service provider just put the ticket more often into the status ‘on hold’ or ‘waiting for xyz’, this is usually the time when the SLA watch stops and this way you can gain significant time. Another possibility: Agree with the enduser to make 2 or 3 tickets out of 1 (closing the initial one and open a second one), each one meeting the SLA target and addressing one aspect of the same incident…. Above list can be of course expanded by other interesting examples. You might argue that avoiding above behaviors is just a question of integrating appropriate rules into the service level agreement. I doubt that this is possible to close all these gaps and you might end up with a document that is not practically usable. Also considering the fact that the IT service provider is misusing these gaps (and you ending up micro-managing your outsourcing partner to close the gaps) shows that this cannot be the right solution. 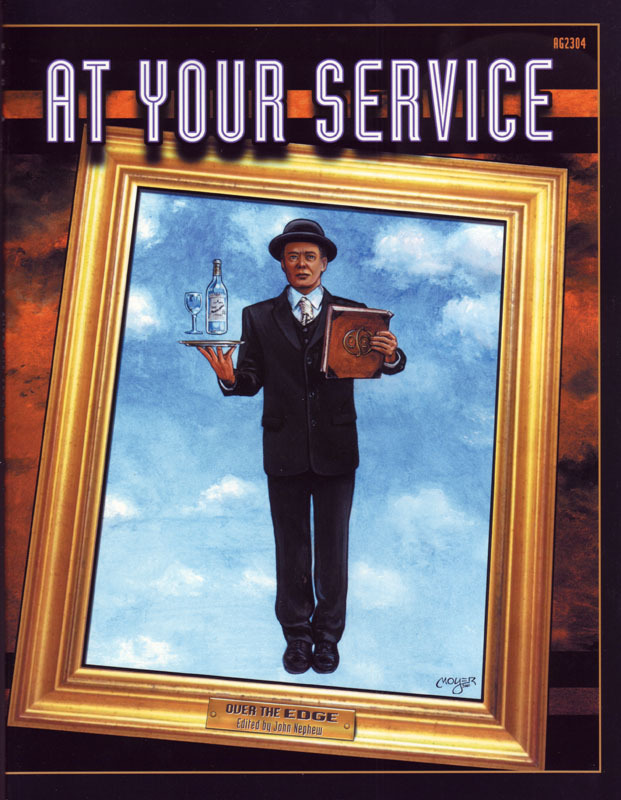 You would have been better off with a service provider demonstrating true Service culture. Finally the question is how do you find out if you are on the right path if the SLA only gives you limited confidence? One suggestion to find out if the delivered IT Service levels meet the expectations of the customer is to perform a customer satisfaction survey. By doing do, you look at the real perception of the customer. If you identify a mismatch between customer perception and service level reports, this might reveal problems in the area of service culture, which need to be addressed. 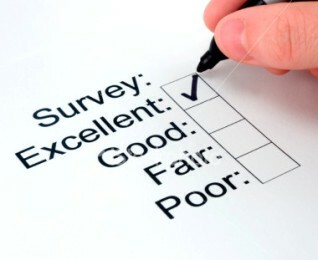 Customer Satisfaction Surveys should be performed on a regular base (e.g. once a year) and one important point is that they should be seen as an instrument to improve the IT service quality. This is also why the customer satisfaction survey not only should contain rating scales for the different aspects of the IT service, but also some free text form, where the customers can indicate what they don’t like, why and what they suggest. Make sure that these inputs are analyzed and consolidated into a Service Improvement Plan, resulting in concrete actions to improve the IT Services. This shows your customer that you have a true ‘service culture’.